Search our complete list of manuscript collections from a wide range of poets, presses, magazines and organizations. One of the world’s greatest literary treasures resides at the University at Buffalo─The James Joyce Collection. Comprising more than 10,000 pages of the author’s working papers, notebooks, manuscripts, photographs, correspondence, portraits, publishing records, important memorabilia and ephemeral material, as well as Joyce’s private library and the complete body of significant Joyce criticism, the collection distinguishes UB as the leading resource for Joyce scholarship. 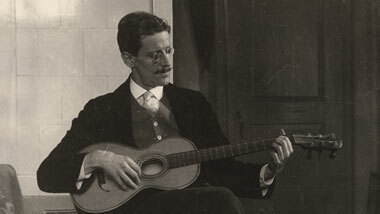 The James Joyce digital collection includes select photographs from the James Joyce Collection.